SCENARIO: we’ve all just watched Mark Few and Gonzaga bring the trophy to Spokane for the first time, after a final score of Gonzaga 86, Auburn 74. It was a dominant season for the Zags throughout WCC play, as they largely decimated their fairly inferior competition. Aside from a loss away to San Francisco this upcoming weekend on January 12, they run through the conference with little trouble at 15-1. I’m a bit disappointed that Gonzaga doesn’t get to play Portland at home this season. Gonzaga would have a chance to win that game by 70. As it is, they beat a really bad Pilots team by 49. There is one slight speed bump in the WCC tournament, which allows the conference to become a two-bid league. The Dons of San Francisco topple Gonzaga again in the final to snag a spot in the tournament, which they would have otherwise just missed. Gonzaga, having finished 30-4 and ranked #8, get a 2-seed in the tournament. 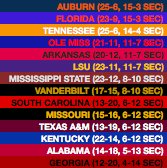 Auburn, now, has made the Final Four in the first three editions of Season Sim. In the first two, they were stopped in the national semifinal, but this time they fall in the championship game. Auburn, in this edition, finishes the SEC season as the #1 seed, a game ahead of Tennessee but tied with surprising Florida at 15-3. Surprisingly, the Tigers’ three conference losses are all at home, going 9-0 on the road. Despite losing their first SEC tournament game to 9th-seeded South Carolina, Auburn hangs on and gets the final 2-seed spot with a record of 25-6. Elsewhere in the SEC, it’s another disastrous season for Kentucky, just like in the previous edition of this sim, as they finish 12th in league play, but despite that, they’re a capable team. They prove that by running all the way through the SEC tournament, winning 5 games in 5 days to surprise everybody. They probably would have made the tournament anyway as long as they didn’t embarrass themselves, but this weird, weird Kentucky season nets them a 6 seed. Duke is also one of the Final Four teams, losing to Gonzaga in a high-scoring rematch of their high-scoring game in Maui earlier this season. 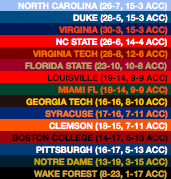 The ACC race turns out to be wildly entertaining, with Duke, UNC and Virginia all tying for the regular season crown at 15-3. Of those nine losses, five have to come in games between those two teams, so in games against the other 12 ACC teams they combined to go 40-4. All three are consensus top-5 teams; NC State finishes just one game behind at 14-4. In what I think would be an all-time first, Virginia, Duke and UNC all get #1 seeds! Conference tourney champ Virginia is the #1 overall seed at 30-3, but 28-5 Duke and 26-7 UNC are seeded second and fourth overall, respectively. The other Final Four team is, surprisingly, Ohio State! 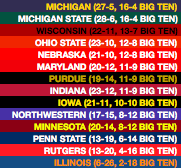 It’s a resurgent year for the Big Ten, and its strength is on display all season with these teams continuing to beat up on each other. Both Michigan and Michigan State finish 16-4 to pace the league, but seven other teams finish between 13-7 and 10-10, and all nine of these teams make the NCAA tournament. The Buckeyes don’t stand out in particular, besides “wow, another good team from the Big Ten”, though they do grab the last double-bye in the conference tournament by winning the tiebreaker for 4th place. They are unranked in the AP poll going into the tournament (for all its strengths, only 3 Big Ten teams are ranked in the top 25), and get a fateful #9 seed, put into the same 4-team pod as North Carolina and #8 seed Villanova. Nobody expects the Buckeyes to come out, but come out they do. Speaking of Villanova, there’s no Big East title for the defending champs. The team du jour in this conference this season seems to be Marquette, and it is they who pull out the regular season title by two games. It’s a wide-open season otherwise, with 8 of the ten teams finishing between 11-7 and 7-11. Only Marquette and last-place DePaul are outside that grouping. The best story might be a huge surprise from Xavier, finishing 3rd despite having had a pretty bad season so far (unfortunately, still not good enough to make the tournament). In the end, the wide-open nature of the Big East makes the tournament more exciting, and it’s Seton Hall who makes a run to the title. This conclusion to the season would definitely be viewed as a positive for the Pac-12. In an outcome that would be almost impossible if the season ended today, four Pac-12 teams get NCAA tournament bids. They’re led by probably the biggest surprise of all in UCLA, who rally behind interim coach Murry Bartow, lose only twice in conference play, and go unbeaten at home. For Oregon, a 13-5 conference record and run to the conference title game is enough to sufficiently improve their standing and they get in. The same is true of Washington, except they go 12-6 and win the tournament outright. ASU is the fourth Pac-12 team to get in, just grabbing one of the last four bids for the second straight year. Those of you who are coming back into following basketball after the end of football season might be surprised to see that one of the final three undefeated teams in college basketball this season is the Houston Cougars. Well, Houston is for real, but in this simulation, that undefeated run ends tonight at the hands of Temple. (Michigan is the last undefeated team, lasting until January 25 @Indiana) Despite all that, Houston wins the AAC by a couple of games at 15-3 and makes the tournament for the second straight year, the first time they’ve done that since going to back-to-back championship games in 1983 and 1984. One more at-large bid is unaccounted for, if you’ve been counting. It shouldn’t be a surprise: Nevada is still a tournament team, despite the fact that they lose four games in the Mountain West and lose the tourney championship. The Wolf Pack actually finish 3rd in the MWC, behind both Utah State and Fresno State, and it seems like Utah State would have merited an at-large bid as well, only losing their two games against Nevada and blitzing everyone else. But they’re the ones who win the tournament, so they’re in. What a wild tournament this is! Both First Four at-large winners advance past their six-seeds, 13-seed Grand Canyon makes the sweet 16, 12-seed San Francisco, who, as mentioned before, needed to beat Gonzaga to make the tournament at all, winds up in the Elite Eight, and 9th-seeded Ohio State cracks the Final Four! That’s it for this Season Sim! This is just one way that this 2019 season could finish out. Turn out next time (Sunday) to see what else might happen!